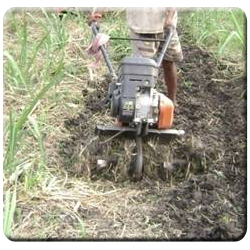 The Sustainable Sugarcane Initiative (SSI) aims at providing practical options to the farmers in improving the productivity of land, water and labour, all at the same time. SSI is also expected to reduce the overall pressure on water resources and contribute to recovery of ecosystems. 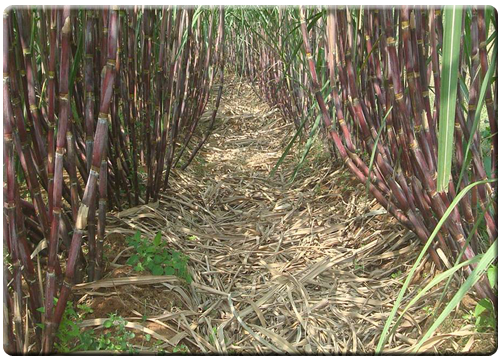 Sustainable Sugarcane Initiative is an innovative method of sugarcane production using less seeds, less water and optimum utilization of fertilizers and land to achieve more yields. Observe and avoid canes with disease infestation like fungus growth, spots etc. 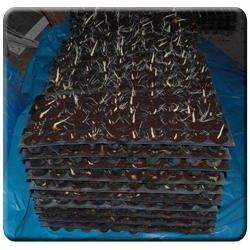 The buds can be treated with 1 Kg urea, 50g Carbendazim and 200 ml malathion dissolved in 100 litres of water and soaked for 15 minutes and shade dried for 15 minutes to induce quick germination of buds. The buds can also be treated by biological method by dissolving 2 kg of Tricoderma Viridi in 100 litres of water and soaked for 15 minutes and shade dried for 15 minutes. 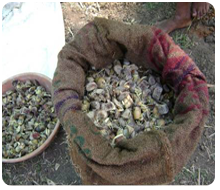 After chemical / biological treatment, the buds can be treated with 1 per cent lime solution and placed air tight in a gunny bag for 3-4 days. 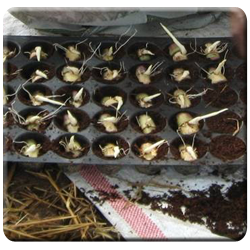 The gunny bags can be opened on the 4th day and healthy sprouted buds can be selected for raising nursery. 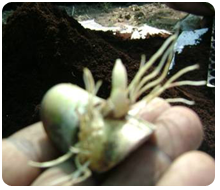 Bud treatment helps in protecting the crop from pest and disease incidence in later growth stages. 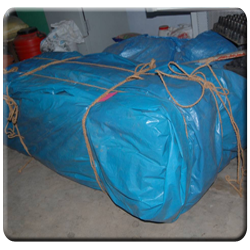 An optimum environment with good water facility, pro-tray, decomposed coco-pith and polythene sheet are the basic requirements for good nursery in shade net shed is a good proposition to provide shade and create other favourable conditions like warm and wind free environment. Fill half of each cone in the tray with coco-pith and place the buds flat or in a slightly slanting position in the cones. Do not press or push it hard and ensure that the bud side faces up. Cover the bud chips in trays completely with coco-pith. 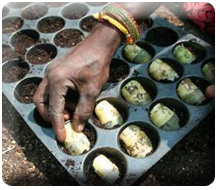 Based on the moisture content of coco-pith, watering to the trays (seedlings) has to be done using rose cans. Watering can be stopped one day before transplanting. 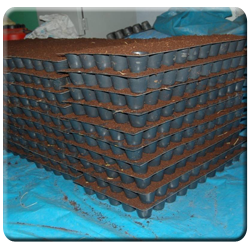 This will loosen the coco-pith in the cones and help in easy lifting of seedlings for transplanting. Maintain optimum plant spacing of 5x2 ft. for easy sunlight penetration, profuse tillering and mechanical harvesting. 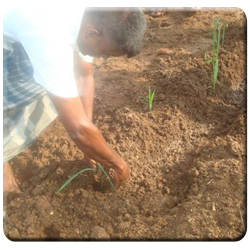 To moisten the soil, irrigate the field one or two days before transplanting. 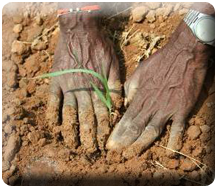 Similarly, irrigation should be given immediately after planting. 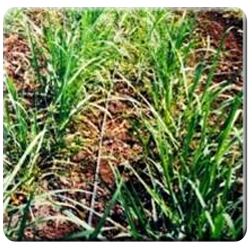 After the establishment of 2 or 3 tillers, the mother shoot may be removed just one inch above the ground to facilitate more number of tillers and uniform maturity. Wider spacing under SSI provides scope for intercropping with vegetables, pulses, water melon, cucumber and green manure crops. 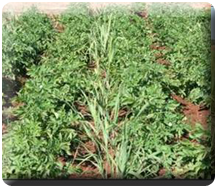 Intercropping facilitates weed control, soil enrichment and additional income. Weeding has to be done at 30, 60 and 90 days after transplanting. Earthing up has to be done on 45th and 90th day after planting for enhancing aeration and root growth. For effective photosynthesis, only the top 8-10 leaves are sufficient. Therefore it is important to remove the lower dry and green leaves during 5th and 7th month, and applied as much in the interspaces. 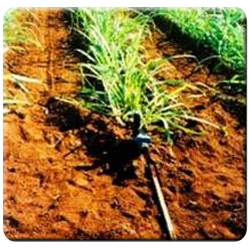 The productivity of cane under SSI can be enhanced by practicing drip irrigation with fertigation. 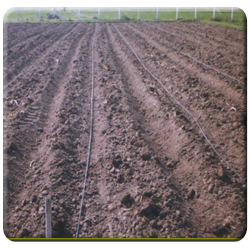 Based on the soil type, drip irrigation can be scheduled daily or once in three days. Fertigation can be done at ten days interval. 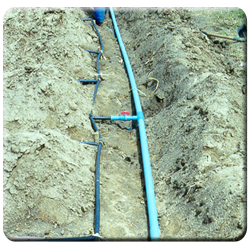 The water use efficiency is higher in drip irrigation and can save irrigation water to the tune of 55 per cent (1200 mm). 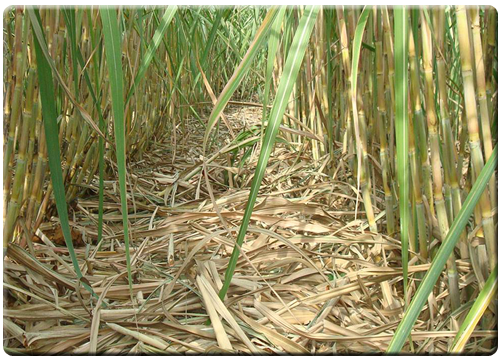 Nutrient management in sugarcane cultivation is very essential for better crop growth. 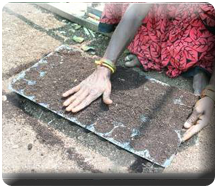 It is always better to know the required quantity of nutrients through soil testing and enrich the soil accordingly. If it is not feasible, NPK can be applied at the rate of 275 kg, 63 kg and 115 kg per hectare, respectively through inorganic or organic sources.